closed, multi-sided, roughly equidimensional, patterned ground features, typically 15 to 30 meters (16 to 33 yards) across; commonly resulting from thermal contraction cracking of the ground. either of the two points on the earth's surface at which magnetic meridians converge; the horizontal component of the magnetic field of the earth becomes zero at this point; also called the dip pole. a crevasse near the side of a glacier formed as the glacier moves past stationary valley walls; usually oriented about 45 degrees up-glacier from the side wall. a part of the seasonal ice zone that varies in width (100 to 200 kilometers, 62 to 124 miles) that extends from the ice edge into the ice pack, where waves and swells affect the ice; often characterized by highly variable ice conditions; in general, it is wider in the Antarctic than the Arctic. 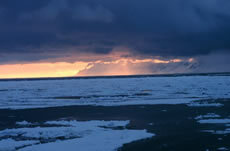 A scenic view within the marginal ice zone. a climate dominated by the ocean; because of the moderating effect of water, sites having this climate are considered relatively mild. a layer or body of unfrozen ground, that is perennially cryotic (T < 0 degrees Celsius), forming part of the coastal or subsea permafrost. of, relating to, or adjacent to the sea. downslope movement of soil or rock on, or near, the earth's surface under the influence of gravity. the cryostructure of frozen sand in which all mineral particles are bonded together with ice. the cryostructure of frozen silt or loam in which ice veins form an irregular three-dimensional network. the cryostructure of frozen sand and gravel in which all mineral particles are bonded together with ice, but larger pore spaces are not completely filled with ice. mean annual temperature of the ground at a particular depth. mean annual temperature of the surface of the ground. the properties of frozen ground governing its deformability and strength. the failure strength of a material under given loading conditions. a ridge-shaped moraine in the middle of a glacier originating from a rock outcrop, nunatak, or the converging lateral moraines of two or more ice streams. unlike snow dunes that are piles of drifted snow, antarctic megadunes are long, undulating waves in the surface of the ice sheet that are 2 to 4 meters (6.5 to 13 feet) high and 2 to 5 kilometers (1 to 3 miles) apart; they are slightly rounded at their crests and are so subtle that a person on the ground cannot see the pattern. pools of melted snow and ice on the sea ice surface created during the summer melt. a channel within, underneath, on top of, or near the side of a glacier that drains meltwater out of the glacier; usually kept open by the frictional heating of flowing water that melts the ice walls of the conduit. a mercury-filled glass tube in which the height of the mercury column is a measure of air pressure. an atmospheric circulation in a vertical plane oriented along a meridian; it consists of the vertical and the meridional (north or south) components of motion only. top of the mesosphere, situated at about 80-85 kilometers (50-53 miles). the region of the atmosphere between about 50 kilometers (31 miles) and 80-85 kilometers (50-53 miles), extending from the top of the stratosphere to the upper temperature minimum; it is characterized by a broad temperature maximum (near 0 degrees Celsius) at its base, from which the temperature decreases to a minimum (about -90 degrees Celsius) at the mesopause level. changes in the structure and texture of snow grains which result from variations in temperature, migration of liquid water and water vapor, and pressure within the snow cover. any one of the properties or conditions of the atmosphere which together specify the weather at a given place for any particular time (for example, air temperature, pressure, wind, humidity, thunderstorm and fog). study of the atmosphere and its phenomena, including its structure, properties, and physical processes. closed, multi-sided, roughly equidimensional, patterned ground features, less than 2 meters (6.6 feet) in diameter; usually caused by desiccation cracking of fine-grained soil materials. in terms of wavelength, microwaves range from 1 millimeter to 1 meter, and are much longer than the shorter visible (0.38-0.78 micrometer) wavelengths; these longer wavelengths allow microwave energy to penetrate through clouds; because these sensors measure microwave energy, they do not rely on sunlight for illumination so they can acquire images regardless of time of day; can be either passive or active; passive sensors detect and record naturally upwelling microwave energy emitted from objects; active sensors generate their own beam of energy, generally with an antenna, which then detects the returned energy patterns (backscatter) that indicate the presence of features and their position relative to the sensor; radar (radio detection and ranging) was an original active microwave sensor that became widely operational with the onset of World War II. clouds composed of ice crystals and water droplets in the middle region of the atmosphere, from 2,000 - 6,000 meters (6,500 to 23,000 feet); includes altocumulus, altostratus, nimbostratus, and portions of cumulus and cumulonimbus clouds. a palsa in which the frozen core extends below the peat into underlying mineral material. Also known as tundra mires, generally described as an area of wet, soggy, muddy ground., and often feature a layer of peat over permafrost. precipitation consisting of a mixture of rain and wet snow; it usually occurs when the temperature of the air layer near the ground is slightly above freezing; the British term for this mixture is sleet (which has a different meaning in the United States).